TSS PRO 650 is a ready-to-use, highly effective, consolidation treatment that stabilizes, strengthens and densifies natural stone and masonry by replacing the natural binding materials lost due to deterioration, decay, weathering and other causes. May be used on most types of natural stone, concrete, stucco, brick, terra-cotta, etc. TSSPRO650 is a ready-to-use consolidation treatment that stabilizes, strengthens and densifies natural stone and masonry by replacing the natural binding materials lost due to deterioration, decay, weathering and other causes. 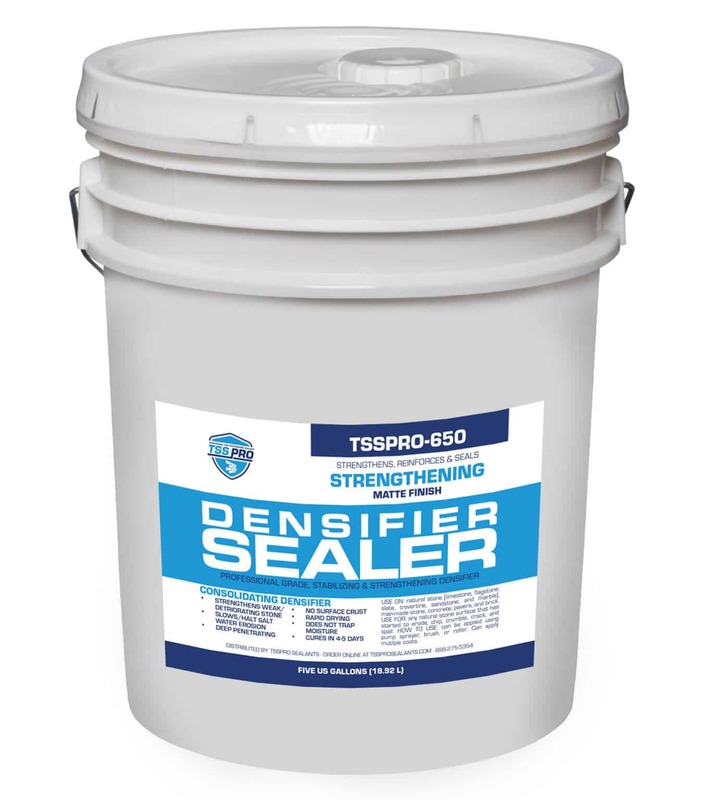 When properly applied, TSSPRO650 penetrates deeply, 10-20cm (4-8 inches) and retains the substrate’s natural vapor permeability and is water/salt water repellent. In instances where salt water can continue to be on the surface, a second water resistant surface silicone can be added which will form a matrix that repels salt water while TSSPRO650 is curing. In addition to the general consolidation of severely deteriorated masonries, TSSPRO650 is an effective pretreatment for friable substrates that need to be strengthened before cleaning, patching or coating and can be very effective at slowing or preventing on-going salt water erosion. TSSPRO650 may be used on most types of natural stone, concrete, stucco, brick, terra-cotta, etc. TSSPRO650 is based on a silane with an extremely small molecular structure which enables them to penetrate deeply into deteriorated masonry surfaces, collecting at contact points between individual stone grains. An internal catalyst and atmospheric humidity then convert the silane into silicon dioxide (Si02) a silica-gel like binder which binds the stone particles together. The newly deposited silica-gel like binder replaces the stone’s and masonry’s natural cement which has been lost due to weathering influences exhibiting chemical characteristics and thermal expansion/contraction characteristics which are virtually identical to that of natural stone. TSSPRO650 contains a water repellent and will repel water and salts in the water after the surface cures, about one hour. Full curing may take as many as 4 – 5 days. Multi-component – strengthens deteriorated/deteriorating stone. No aesthetical change to substrate. Small molecule, low viscosity allows deep penetration. Does not form surface crust. The cross-linking binder is mineral – similar to the original stone. Rapid initial drying – no dirt attraction. Forms no by-products harmful to the masonry. Treated surfaces “breathe” – does not trap moisture – cures water resistant. TSSPRO650 is very acid rain resistant. Vertical surfaces are more difficult to get proper product demonstration. Apply from the bottom up. Apply enough material to create a 6” to 8” rundown below the spray contact point. When using a brush or roller also saturate the substrate – vertical surfaces leave less time for penetration, complete saturation is important. Not recommended for below-grade application. Although it can greatly slow and delay salt water erosion it may not eliminate all erosion. Limited shelf life – remains storage stable for approximately 12 months in sealed containers. Not suitable for architectural concrete block, dense stone, and some types of marble. Surface and Air Temperatures: Ideal surface and air temperatures would be between 41–68°F (5–20°C) during application. Relative humidity should be greater than 40%. Excessive surface heating can be prevented by shading with awnings. Low Humidity Environments: In low humidity areas – surface may need to be dampened prior to application. Clean tools and equipment immediately with mineral spirits, denatured alcohol or an equivalent cleaning solvent. Remove over spray and spills as soon as possible. Store in a cool, dry place and away from potential ignition sources. Keep tightly closed when not dispensing. Published shelf life assumes upright storage of factory-sealed containers in a dry place. Maintain temperature of 45–90°F (7–33°C).